Now more than ever before the healthcare industry is riddled with challenges. A growing demand for quality care and a rising shortage of qualified providers presents new pressures for organizations. This means leaders are under increasing scrutiny to find new ways of doing more with less resources. Settling for inefficient processes isn’t an option. Even being paperless is no longer enough. 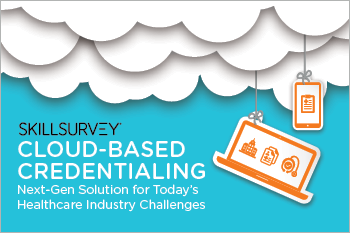 In a 2016 survey of members of National Association of Medical Staff Services (NAMSS), SkillSurvey found that credentialing processes, paper-based and paperless alike, take an average of 3-4 weeks to get a provider privileged. Waiting nearly a month for privileges is entirely too long and your top recruited providers aren’t the only ones suffering the consequences – your patients and bottom line are too. Considering today’s challenges in healthcare, medical staff leaders need to be looking to new technology solutions that will help get their providers on staff and treating patients faster.